We’ve come to the end of a rollicking good show with a finale that really does its job. Let’s see how the unluckiest girls of Class 7 finished up their summer school! As of the end of the first part of the outdoor school ended, all of Class 7 was on the run from Miss Kodaira and Timothy in a game of garden tag. And at the beginning of the show, the only ones who haven’t been caught are the girls of the Four-Leaf Clover team, i.e. our heroines. But that only lasts for about 10 seconds, before Hibiki stumbles upon Miss Kodaira, and even the most athletic of the main characters isn’t going to escape her, especially with her pointless and self-serving rambling. And Ren avoids the mini-Timothys with some Ewok-like help from the forest animals, only to get caught later. But they get a break when Miss Kodaira modifies the rules to allow escapes, setting up a wonderfully ridiculous battle between the forest animals and the Mini-Timothys where Ren and Hibiki fly the coop. Meanwhile Hanako and Hibari aren’t really challenged by the chasers, but are running into issues of heat. 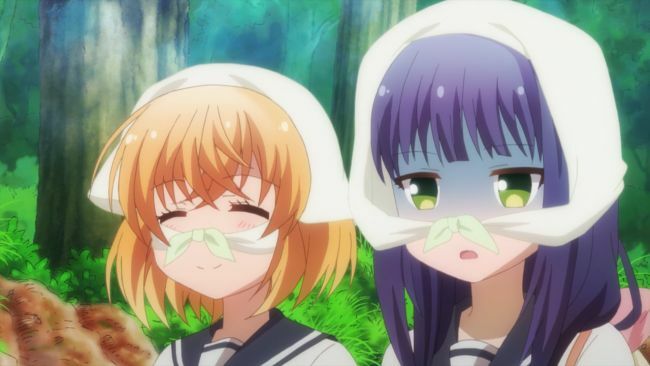 Never too late to introduce a running gag for the episode, Hanako tries to convince Hibari to wear a scarf like a bandit, and does succeed in calling her “Hibari Hood” for the half of the episode, especially since Hibari finally gives in. And in a completely separate location, Botan is using the same kind of head covering willingly, which really brings home the gag. And Botan, in all her travels through the underbrush, has managed to find a couple of the carvings while staying free. But the real action happens when Hanako and Hibari are trapped in a ground subsidence, hanging on to the ledge, to be saved first by Botan, who I think it’s notable doesn’t act like she’s broken an arm or shoulder trying to save them, just a cramp in her leg, nor does she fail in trying to run to find them in the first place. This leads more to the idea that most of Botan’s frailty is that she’s convinced she’s frail, and a sufficient reason, such as her friends’ peril, lets her overcome it. Unfortunately, in getting saved from the spontaneous formation of a hot spring, the whole group gets caught, and has to face the punishment of sleeping outside and foraging for food. 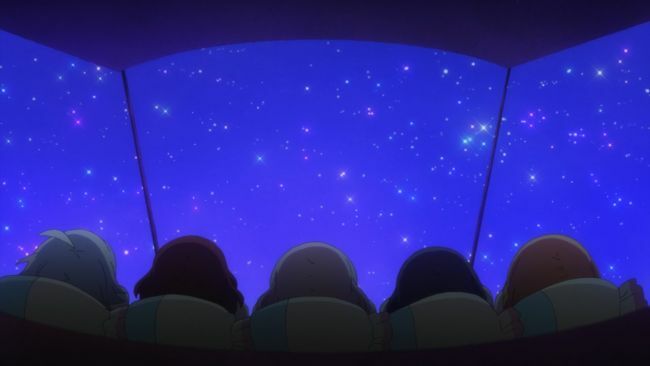 But this turns into a reward for the girls who are able to enjoy a night of camping, have a good dinner of fresh fish, fruits and vegetables, and spend the night under the stars. They even spend time with Timothy, who we had seen earlier in the day is more directly controlled by the twin-tail blond girl than I had thought, which again makes me think that she feels like she is at least somewhat a friend of the other girls. Timothy even lets Hanako hold him! And are the rest of the girls finally learning to see things Hanako’s way? This time when Hanako describes how much fun their day was, the others definitely agree with it, they just hadn’t looked at it that way before. Anne Happy could easily have been a show like Yuru Yuri, or KinMoza, or Is the Order a Rabbit?, where you have a group of girls who hang out together, do high school girl things, and be entertaining without really going too deep into a story or characters or causation. But that’s not what Shin Oonuma does as a director. His shows would much rather set these characters up, put them inside the world, and let them find their end. That’s exactly what this whole series felt like. It set the tone early with the setting, letting us know that extraordinarily uncommon things would happen to these characters due to the unluckiness of Anne, a condition which surpassed everything a seasoned teacher, Miss Kodaira, had ever seen, and allowed that setting to be one where the silly, ridiculous, and stupendous happened to characters that were always doing their best, and who ended up really not so bad off. A show like this treats its characters fairly, even when they’re the unluckiest people in the world. Even the ending, with the animals rescuing Ren and Hibiki, Hanako and Hibari falling into a sudden pit, and the group losing but winning, felt deserved. They lost, but didn’t really “lose” and the somewhat confounding presence of Miss Kodaira even acknowledges that these girls, who have been some of her worst students in terms of grades at absolute happiness, have been some of her best students in the realm of learning to be happy. And they don’t get there because that’s what the plot says, or that’s how it was written in the script. They get there because they become friends, because they help and support and enjoy each other. And even with that, there’s still so much more in each of these characters that we haven’t seen. We haven’t seen why Hibari’s always feeling inferior to her parents, or who Botan’s “much better” little sister is. We haven’t spent more time with the twin-tail blond girl, nor found out what Hanako’s father is like, or if he is even around. And these things also help make the characters feel well-rounded, that there are things that have been held back, not just things that would be completely out of the blue were they brought up later. And I think the OP and ED deserve special mention as well, because I was unable to just skip the OP any time during the season. A catchy song, lip-synced performances, and use of the chibi versions of the characters, which were also used to wonderful effect during the show in quick eye-catch style as emphasis or a slight story aside. They gave the show an outlet to be even a little more silly, with things like Thunder Woman! when the lightning hit the pool. All in all, everything in the show worked, and always left you feeling happy when you were done watching it. Is it the best show of the season? I can’t say it is, in a season that has Flying Witch, but if not for that lovely show, Anne Happy would have been my far and away #1. I would have liked to have seen blonde twin-tail fleshed out a bit more; like you said, she was like a remote control motion capture pilot for Timothy? That’s a neat plot point to ignore. Maybe to neat? I can see how something like that might steal the show. I’ll say that I think I enjoyed the more relaxed realism of Sansha Sanyou more, but only just a touch more than Anne Happy. And yeah, Flying Witch comes out on top. But honestly the best was Bread Girls…we all know this. I found that I could get into the characters of Anne Happy more than I could for Sansha Sanyou. There was just something about them that didn’t click as much for me. And I found the setting far more interesting in Anne Happy, and maybe even a little bit more ‘realistic’, because for me, when you set up that there’s a girl who is that supremely unlucky, the idea of those things happening around her becomes believable. Contrasting that, Yamaji and Sonobe just never felt like they were following the rules of the universe. I think as I say and you agree, the depth of Anne Happy is what really set it apart. They gave us more of the world to think about without having to spend time on what was really going on. As such, it leaves us wanting to know more about it, which is always the right way to leave a show. I saw Yamaji and Sonobe as the adults “intruding” sometimes into the kid’s world. With Sonobe’s loliesque stature being a bridge from one to the other. So they were following their own rules. But, really, I think the difference is splitting hairs.